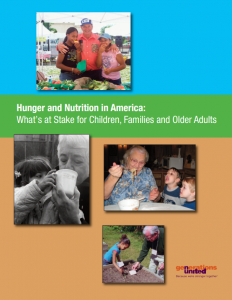 Hunger and Nutrition in America: What's at Stake for Children, Families and Older Adults is a report from Generations United that includes a national survey, profiles of programs and recommendations for engaging people of all ages to tackle food insecurity. healthy life. About 4.5 million (one in 12) adults age 60 and older are now at risk of hunger or food insecure. Using an expanded measure, nearly 8.3 million (one in seven) older adults are, at times, anxious about whether they will have enough to eat. These disturbing trends cannot be ignored in today’s America. Adequate nutrition helps children and youth concentrate in class, improves their memory and overall behavior, and leads to better health and fewer visits to the doctor. For older adults, access to good nutrition also improves memory, helps maintain healthy physical activity, and reduces the number of trips to the doctor. The benefits of good nutrition are clear. How can we ensure the most vulnerable among us are well nourished? In thousands of communities, houses of worship, food pantries, soup kitchens and emergency shelters play key roles in providing food assistance to needy children, youth, older adults and families. They bring people of all ages together to help their neighbors during times of hardship and alleviate a painful source of anxiety: where the next meal is coming from. And, of course, a function of the federal government is to address hunger.